The Masters International Championships Europe ran for the first time last year. Regular readers will know that last year I had a rollercoaster of a year competition wise and this comp was definitely one of the more bumpy bits! But as I haven’t competed since the World Masters due to injuries and niggles it was definitely time to dust myself off and step up again! I am currently in the upper end of masters 2 (next year is a landmark birthday) and as I have explained previously I rarely get the chance to compete in my own age category. Despite the recent petition which saw the Pan American Championships open up a full female masters programme there is still only five opportunities worldwide that offer a full women’s programme. 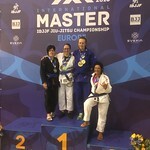 This is the only IBJJF European event to offer above masters 1 for female competitors. So I feel that it’s important to support it if I can. In terms of my training camp things went pretty well. Following my back injury last year I’ve had to change my approach to training a little bit. Over the last few months I’ve worked hard on my strength and conditioning as well as making some amendments to my game. Generally training felt good and I was able to fully roll right up to the competition without taping myself up or pain killers, which was an improvement on my prep for my last competition (World Masters). So that was goal number one achieved! IBJJF only opened entries to the competition 6 weeks before the event which is a little later than usual (despite it being listed in the calendar for months). Although this didn’t effect the entries from my perspective. My division was twice the size of last year and the Blue Belt Masters 2 division overall had 10 competitors which is way stronger than the three of us who took part in the absolute last year. The venue hadn’t changed from last year but it had improved in terms of event delivery. Electronic screens were in place now for each mat and it did seem to run more smoothly (although by the time of the absolutes it was running over an hour late). The only big negative was that this year the cafe was closed. This meant that you did need to leave the venue for any last-minute water supplies or post competition cravings! In terms of the competition my category was the strange experience of a happy defeat! My match was against a tough competitor who medalled at the Europeans in Lisbon earlier this year. We have been on the competition circuit a similar amount of time and have quite similar games but we had never fought until now. The match itself was a close fought battle. I managed to score the initial takedown but made a mistake during a sweep which meant that I exposed my back giving up a 6 point move. Despite escaping and progressing eventually to a half guard sweep there was only a minute left on the clock, I couldn’t get the pass and the match finished 6-4 (default bronze). Previously I would been inconsolable at failing in my goal to win. But the reality of the situation was that it was a good match. Lots of action, I had achieved lots of things I’d been working on and generally performed well – it was just a silly mistake / tactical error that cost me the match. Another day, another draw and it could have been different but thats BJJ competition for you! The absolute was scheduled for 5:30pm but I was in the pen for nearly an hour before stepping onto the mat. I was fortunate enough to get a first round bye but my first match was against the divisions heavyweight. I decided just to go for it and not hesitate which turned out to be the right decision. A quick submission saw me moving on into the final. The final match was against a lightweight and was an all British affair. She was a tough competitor constantly working against me. I was up on points when she hit a great sweep attempt which saw me pulling a half guard from turtle. Luckily, my half guard game was strong enough for me to hold on and take the win. Obviously it was great to win gold but this was special to me as a European level gold medal was the main thing missing from my Blue Belt collection. So goal number 2 achieved! Plus I was happily in one piece from the day so that was goal number 3 completed too. Overall, not a bad day as you can’t complain about 3 out of 4 goals acheived! My husband had a really similar experience to myself in his category against a world-class blue belt who had followed him up to Purple. His absolute was literally the last matches of the day but a strong guard game saw him take his first win at purple and a bronze medal. So it would have been celebrations all around but we were leaving the venue around 10pm as the staff were taking up the mats! This limited our celebrations somewhat as we were unable to join his Stealth team mates settling for a dominos pizza, a multi pack of Maxibon and a bottle of beer! I’ve learnt a lot about my jiu jitsu game and my approach to competition each time I’ve competed at the Euro Masters and this time was no different. It was also great to dust of the competition rust. But although I enjoyed competing again I am still planning to stick to my year of BJJ adventures and generally stepping off the competition treadmill. 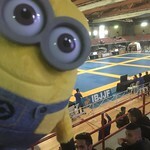 The European Masters is definitely a growing and developing competition and it was one of the IBJJF calendar I still really recommend mainly because Barcelona is still a wonderful city to visit although due to the competition I didn’t get the chance to enjoy it as much as I would like. Especially as the next day I needed to set off the next part of my Spanish BJJ adventure – a mini training holiday to Madrid with Jits and the City which obviously you can read all about next week!